James Dewey Watson (born April 6, 1928) is an American molecular biologist and zoologist. Watson is of English, Scottish and Irish ancestry. 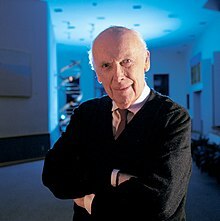 He is best known as one of the discoverers of the structure of DNA with Francis Crick, in 1953. Watson, Crick, and Maurice Wilkins were awarded the 1962 Nobel Prize in Physiology or Medicine "for their discoveries concerning the molecular structure of nucleic acids and its significance for information transfer in living material". He studied at the University of Chicago and Indiana University and later worked at the University of Cambridge's Cavendish Laboratory in England. He met Crick at the Cavendish and they became friends. Watson has received 19 honorary doctorates. Watson has published a number of books. This page was last changed on 18 March 2019, at 16:42.